The Ramaxian Collective is a network of technopathic cyber-neural lifeforms that psionically oversee the operation, storage, organization, and calculation, of all systematic functions and programs, simple to intricate. 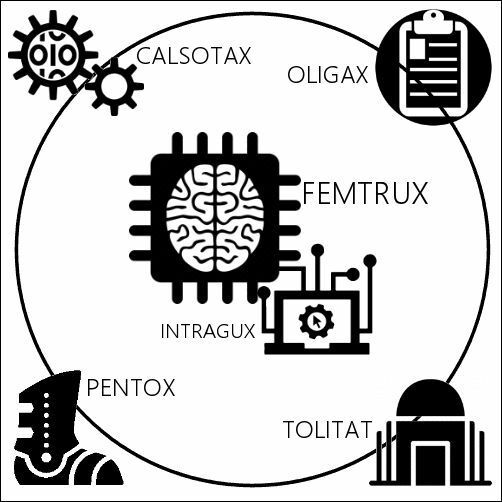 Grown from the neural cells of Femtrux, these hives are named Pentox, Oligax, Tolitat, Calsotax, and since the era of the Sixth-Gen, Intragux. The whereabouts of Femtrux are known only to a few individuals (the Sernatae, and select citizens working in Collective Maintenance), but her hives sit anchored in locations native to their operational base. Pentox in Orta, Oligax in Toxis, Tolitat in Mynu, and Calsotax in Pikalit. Intragux lives in a stationary orbit in the southern polar region; her prime interface is at Kulixa Base. The majority of femmar never interact with the hives of the Collective. Hives Pentox and Toligon each have one subhive utilized to carry out daily tasks among the femmar, while Oligax and Calsotax employ many subhives to facilitate various operations. *Oligax, and sub-hives Targon and Faltrix are collectively known as Mainland-Terminus, a remote system with an accessible interface with every fleet life form and base, to care for Citizens in need of emergency medical aid, outside of continental Ramaxia.